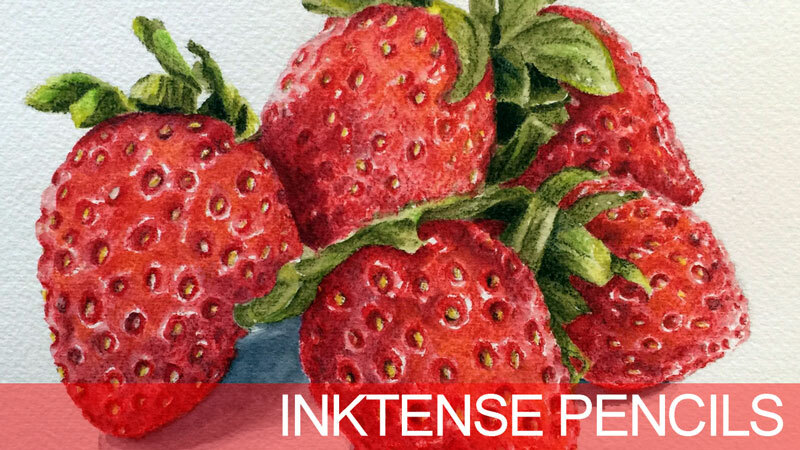 In this lesson series, we explore application techniques for Inktense pencils. As a medium, Inktense pencils behave in a similar manner as watercolor pencils but are much stronger with color. When dry, applications can be layered over existing colors without altering the color underneath, producing interesting glazing effects. Every step of the process is demonstrated and explained in this series which includes four lessons, each one hour long. I used my inktense pencils as a underpainting for my coloured pencil. It creates a very interesting effect. when will part III be available? The recorded lesson usually goes up on the Saturday after the live event. I just returned yesterday after being away for two years. I ordered my Inktense pencils through Amazon. They will get them here in less that 3 months. I had to pay a bit for them though as usual. The set of 24 cost me over $70 US after shipping and customs and everything. They should be here after the lesson on Friday ( Time differences). In the meantime I am trying to make it on my computer with Clip Studio Pro. Not sure how this is going to turn out. Oh yeah, thanks for all the lessons. You have improved my art talents greatly. I am back to find out just what I have forgotten. Hi Matt …. Trying to get back to the lessons (slowly) after several months of illness with my wife. I love the look of the Inktense pencils when they are activated. The drawing of the Strawberries also looks great even before the activation …. I like to look for the way you add the various values of color. Here is a bit of humor: I purchased the Derwent Soft Color pencils (a couple of months ago), thinking they were the water soluble type … then put together a few sample patches of all the colors and then came back with water. Well, … Surprise Surprise. Guess I should have paid more attention to the various types of pencils. Oh well …. Still learning. Thanks for your videos ….. They are very educational!!!! Thanks so much! It happens to all of us!